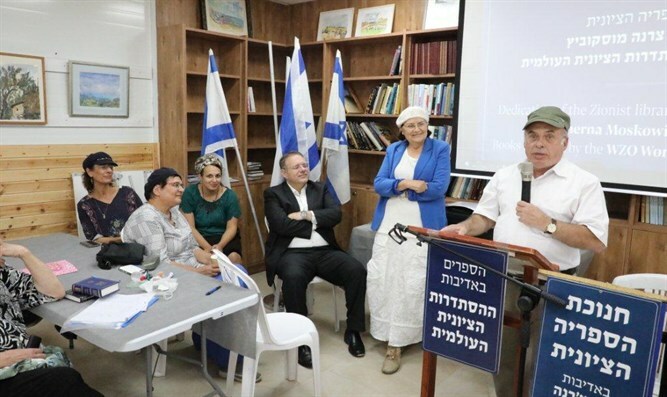 New in Gush Etzion: Unique library with writings on Zionism and its forefathers inaugurated in presence of Natan and Avital Sharansky. At the Oz veGaon nature reserve in Gush Etzion an unique library comprising writings and books on Zionism and its founders was dedicated yesterday. 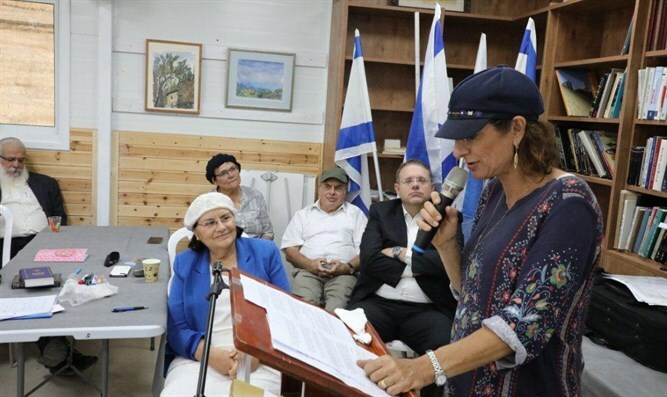 Among speakers were former Jewish Agency head and former Minister Natan Sharansky, World Zionist Organization acting head Yaakov Hagoel, and Gush Etzion Council head Shlomo Ne'eman. 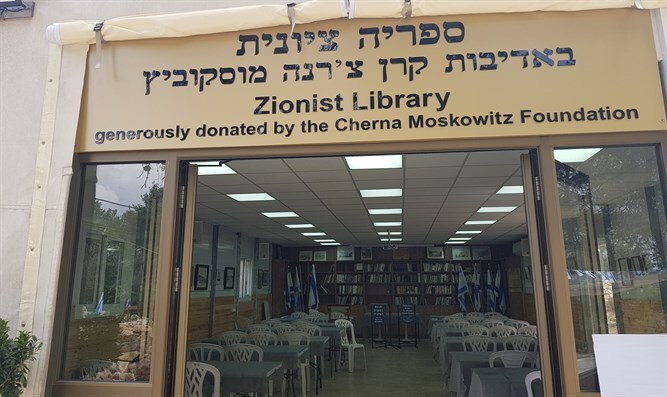 The Zionist Library was established through the generosity of the Cherna Moskowitz Foundation and its books were donated by the World Zionist Organization. This unique library, established by the initiative of Women in Green, includes books and writings dealing with Zionism, its philosophers, and those who implemented it, spanning more than a hundred years. The books and writings will serve students and researchers seeking to become familiar with the writings of the fathers and leaders of Zionism. The library dedication event was also the opening of the first Avital Sharansky art exhibition, wife of Natan Sharansky. The event, attended by more than a hundred supporters of joint activity at the preserve, began with a musical interlude by the Kassels. 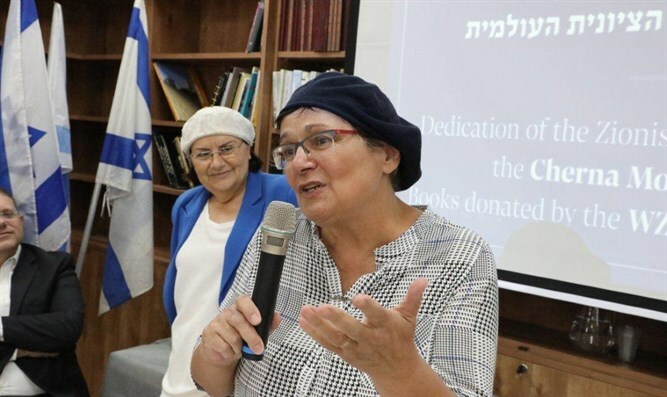 In her opening words, Women in Green co-chair Yehudit Katsover told of how the idea to establish a library of Zionism was born, as a result of meetings that she and her partner in leadership of Women in Green, Nadia Matar, had with thousands of youths from military preparatory schools and high schools throughout the Land. "We saw that a lot of the youth lack basic knowledge about Zionism", she said, noting that the opening of the Zionist Library was a direct outgrowth from the establishment of the Zionist Boulevard where signs are displayed quoting Zionist leaders and the Zionist benches playing Zionist songs throughout the Oz veGaon preserve, a project that was carried out in partnership with the World Zionist Organization and the JNF. Regarding the combination of opening the library with the opening of the exhibition of Avital Sharansky's art and the beginning of the 3rd year of the bet midrash, Katsover said: "We're called the 'People of the Book', the People of 'The Book'. The book is the Bible. The Bible is what characterizes us. We study 'The Book' in our study hall and it's the ideological basis of Zionism. And Avital Sharansky's exhibit is very appropriate – she and Natan Sharansky are current, living symbols of Zionism because of their heroic battle to free the Jews of the former Soviet Union. It was natural for these things to occur together." World Zionist Organization acting head Yaakov Hagoel, who has supported Oz veGaon projects over the years since the reserve's establishment, said at the ceremony: "There's no doubt this place exists thanks to these righteous women, and when Yehudit and Nadia call, I know that the task will come to me and I'm happy to accept it, because everything they do is for the People of Israel and the Land of Israel. I don't know of many Zionist projects like what's been happening here in Oz veGaon in the past four years." In his speech, Hagoel also related to the exhibit of Sharansky's art, saying: "It's wonderful to see Ms. Sharansky's artwork that shows the joy of an open horizon and clarity". Hagoel also told of how, during his childhood, Natan (Anatoly) and Avital Sharansky were his great heroes: "You are the heroes of my childhood", he said, turning to the Sharanskys, and mentioned a current hero, Ari Fuld, who was murdered just a few weeks ago near the reserve: "In the past month we lost Ari Fuld, not far from here. He was a hero and fought like a lion; even after he was wounded he fought that despicable lowlife ferociously. We're surrounded by heroes in this part of the Land." After Hagoel's speech, Avital Sharansky spoke emotionally about how she started out as an artist and about a boy that she met a short time after she immigrated to Israel to whom she gave her set of water colors when she understood that she had to become involved in the struggle to free her husband, since the boy, the son of the family who hosted her, loved painting and wanted to paint. This boy was Avi Walensky, who was later murdered along with his wife Avital, as they were on their way from Tapuah to the community of Eli in Samaria. With a voice choked with emotion Sharansky said that since that tragic day when the couple was murdered, she thinks of that boy's perspective in every piece of art that she creates. Sharansky found it difficult to finish the story herself and when her voice would no longer allow her to continue, her husband Natan completed the story. From this point, Natan Sharansky continued, telling of the time when he met Avital in Communist Russia, when Avital came to look for her brother, an aliya activist who had been arrested by the authorities after a demonstration to which Natan-Anatoly himself had sent him. Some time later, when she immigrated to Israel, Avital faithfully sent postcards to her imprisoned husband: "In her first postcard from Israel, she wrote that there is very strong light here and it was possible to understand immediately what a terrible place we came from and what a paradise we came to," Sharansky said, adding: "In every letter, she wrote about the light of Jerusalem and the light of Israel, about the scent of Israel. There were many drawings of the Land of Israel in these letters." Sharansky continued, relating to the Oz veGaon reserve, the commemoration of the three boys who were abducted and murdered: "There's no other people that's experienced so many tragedies and remains so optimistic. We're a people that's survived the most tragedies and is the most optimistic in the world. This is because we turn every tragedy into something that strengthens and connects us. I meet often with the three families; we're all members of the Committee for the Prize for National Unity, and I see power and nobility. You can see how a tragedy is turned into victory." 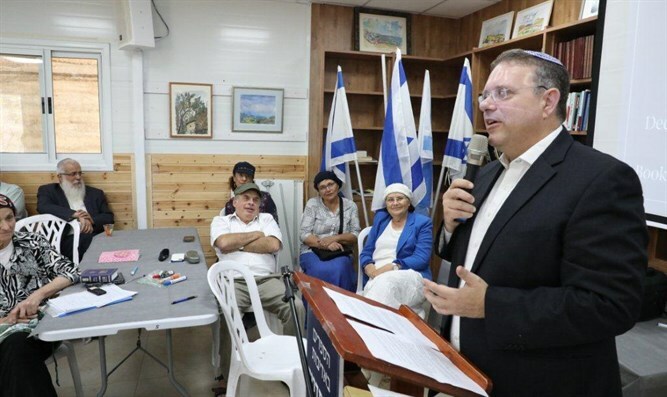 Gush Etzion Council head Shlomo Ne'eman also expressed special admiration for the Sharansky couple's activities, adding that "one can learn about unshakable faith, hard work, and dedication to a task from everyone who is here. "We know there are many obstacles in life and we must overcome them in order to progress. One could say that if we're faced with an obstacle we should turn around and go back, but we're obligated and even commanded to overcome obstacles, to march onward and break through. Nadia and Yehudit and our exemplary Sharansky family: You teach us that we must not stop even for a moment. We must continue," said Ne'eman, adding that while many ideologies have become weakened and disappeared, the Zionist ideology remains strong and a library was even established to preserve its writings. "Because of the goals we set for ourselves, we conquered Judea and Samaria, we must build the settlement enterprise; after building we must define the next task, the People of Israel's full control over the area – sovereignty. It cannot be that after 51 years we're still under military rule and those wearing the uniforms are the ones who manage the opening of the kindergartens and laying of power lines. This is our next goal and the next Zionist step. The books on Zionism of a hundred years ago speak of the step of our full control in Judea and Samaria." "The stories of each and every one of us and the path that he's taken are wonderful stories. The story of the exodus from Egypt is a great story but not as powerful as what we face now," he stated, noting that "there's no equal to the challenges of this generation, the People of Israel had never been exterminated as in the Holocaust; there's never been another time when Jews from all over the world gathered in the Land of Israel." As one of the first community founders in Gush Etzion and as one who has experienced the difficulties of the first phases of settlement in Judea and Samaria, he expressed his sense of joy in seeing the traffic jams at Gush Etzion Junction and the long lines in the shopping centers, in contrast to the days when one had to wait for hours at the hitchhiking posts and the long walk on foot on the way to the communities, as it was at first. "I took a beating on every hill that subsequently became a community and I'm willing to keep taking beatings. This is the divine plan and anyone who doesn't understand this should read the Bible. It doesn't matter who's elected. There's a divine plan and we're all small entities in this system. We fight together with the Al-mighty so we must be victorious." The ceremony to dedicate the library and the exhibit concluded with special thanks and blessings to Mrs. Cherna Moskowitz for her continued support of Zionist projects all over Israel and with words quoted by Nadia Matar from Rav Kook's speech at the dedication of the university at Har Hatzofim in 1925: "With our own eyes we see the wonders performed by the Redeemer of Israel, who performed this great thing for us. To raise his People above all other nations, to provide us with a plowed field in Judea, to give us the power and the spirit to begin to form the life of our People, for eternity on the Holy Land."